Driving home from our trip to The Woodlands brought some introspection. For one thing, there was plenty of nothing to do and plenty of time to do it. Also, we were traveling home from a memorial service that celebrated the life of someone that meant something in my life. For our trip home, we were given a beautifully detailed, color-coded detour by our hostess and a somewhat different detour hastily sketched on a paper napkin by one of our table-mates. This was due to the fact that I45 had some intense construction going on, causing traffic congestion all around that area. Since we’d parked in a free covered garage down the block that no one else seemed aware of, neither of these maps gave us the right starting point. Added to all this was an unfortunate coincidence that there was some sort of children’s carnival going on adjacent to our parking garage and so the city forced us to take their own mandatory detour. On the way in and on the way out, I kept saying to my hubby “Don’t hit a kid; don’t hit a kid,” like a mantra. But I’m getting to the end prematurely, let me go back a bit. The morning of the service, the carnival was just opening and a man and woman were standing near our garage entrance/exit with bins full of plastic bags filled with who knows what to give out to parents as they entered. Just as we were leaving the garage to head out to the church, the woman suddenly dropped her arm full of plastic goody bags all across our exit path. My spouse slammed on his breaks just in time as she bent over to pick these up, one at a time, slowly, dropping a few more, and then picking those up. Ever been someplace unfamiliar and worried you won’t be on time? To say we were a little frustrated is an understatement. Just as we were considering getting out to help, even with a line forming behind us, her partner turned and helped her out. I think sometimes God tests our patience with these little exercises, just to keep us sharp, you know? Speaking of goody bags, did you know the family created goody bags for all of us staying at the hotel? I’ve never heard of that for a memorial service before, but I guess it makes as much sense as some of the laminated bookmark type souvenirs I’ve seen at other services – including my own sister’s. It was incredibly generous and creative. It’s easy to see these kids grew up as kind and inventive as their parents. The bags contained a sampling of many of their father’s favorite things, special pens, spices, a book, etc. as well as bottles of water – all fun and thoughtful gifts. We had to get to the church early since we were singing with their choir for the service and a rehearsal was called for 10:30. We were late of course. Some folks say you should plan for the unexpected. I don’t think our family ever got that memo. We rushed in, gathered up our music and slipped into our places as the choir director continued his practice. In between songs, everyone took the opportunity to look around and visit with folks we hadn’t seen in years, except on Facebook. As a choir we were a little chaotic at times with all our chatter, but that choir director had the patience of Job, so he thankfully ignored us during those times and kept us moving through each piece at an easy pace. Bless him. And still we worried. Some of us worried our voices weren’t going to make it to the heights necessary for these familiar old songs. Some of us worried we wouldn’t be able to sight read the music on the songs we didn’t know. Some of us worried about losing her voice and had to be fed a steady supply of Cherry Honey throat lozenges (you know who you are). The service itself was very moving. Why is it that at these events you always find out things you never knew before about someone? Like I had no idea Jerry was into creating stained glass art and made several stained glass windows for a local church. This was my youth choir director, and a teacher. Who knew? Not me, that’s for sure. But it seems like every service I’ve ever attended, I learn something about that person I didn’t know before. Even at my own sister’s service I learned more about her youth than I remembered. It seems like we are made up of pieces of a jigsaw puzzle. We share a few little pieces with each person we know, but only a select few get to see the whole picture – the one with all the pieces. In that way, I suppose a memorial service is kind of magical, at least for me. I am always amazed by what I learn, and unfailingly in awe of the person whose life we are celebrating. Once it was all over, we were on our way home. After a 35 minute detour, we finally made it to the highway, and after a bit I looked out at all the lovely tall trees surrounding us on both sides of the road on such a pretty day and asked my hubby “Aren’t these beautiful?” “Hmm,” was his reply. It seems he was getting a little claustrophobic after a while and felt the trees were falling in on him. There were tons of pine trees and a bunch of others I couldn’t recognize. 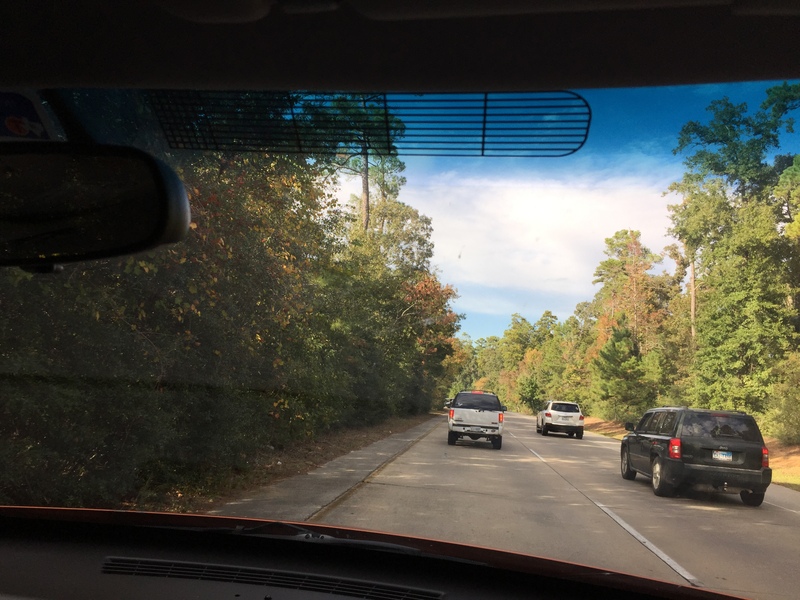 Turns out we were driving through the Sam Houston National Forest. Suddenly, after a turn in the road, we see this big honkin’ statue, taller than the trees. It was a statue of Sam Houston himself. Awesome to see, and I had to wonder how it was transported there. I was able to snap a few pictures (please pardon the window glare), and this break in the trees caused my hubby to feel a little less closed in. That was a little like the whole trip. Funny how we sometimes get so bogged down in all the details, we forget to just sit back and enjoy the ride. The purpose of this trip was to celebrate the life of a man who made an important mark in all our lives. Despite all the details we all worried over, once the service began, we each relaxed into our roles and accomplished just that. And, as a result, we got to honor the memory of an old friend and mentor, honor his family, and reconnect with old friends. Here’s hoping today you take some time to relax, enjoy, and reconnect. 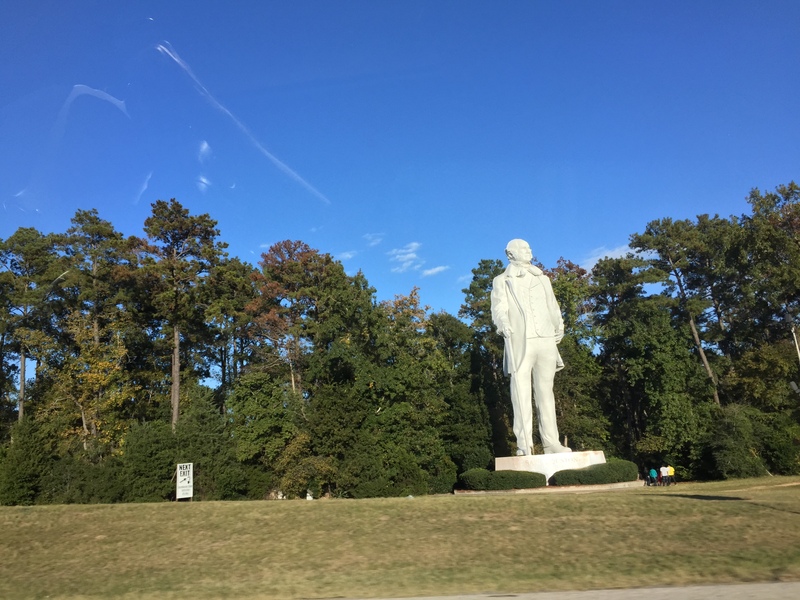 This entry was posted in Journal Post and tagged Blog, Blog post, details, encouragement, Family, forest, Friendship, Humor, Journal, journeys, Kindness, memorials, memories, Post, Random, sam houston, Texas, Tourism, travel. Bookmark the permalink.